Click on the 'Entourage' menu and click 'Account Settings...'. This will bring up the 'Accounts' window with any email accounts listed here. Click on the problematic account and click the 'Edit' button at the top. This will bring up the 'Account Settings' tab of 'Edit Account' window. 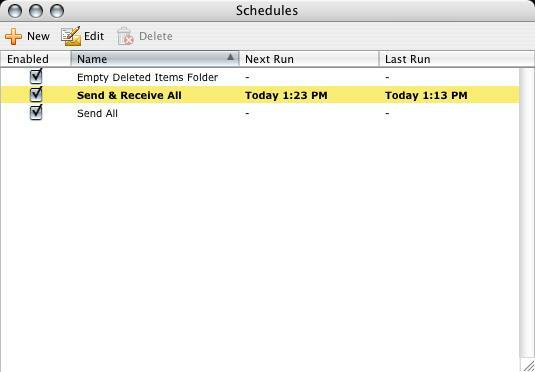 Make sure 'Include this account in my "Send & Receive All" schedule' is checked. 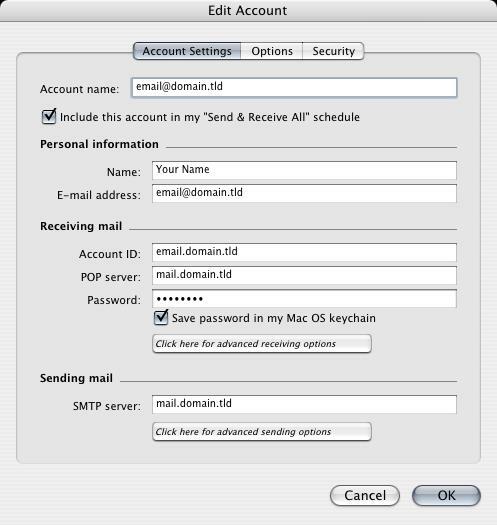 Put a check in the box and type the one you specified in your EasyMail Setup (8 characters maximum). Once your settings look like the settings shown in this screenshot, click on the 'Click here for advanced receiving options' button below 'Save password'. Make sure that none of the boxes are checked, then click the top left square to close that window and return to the main 'Edit Account' screen. Click on the 'Click here for advanced sending options' button below 'SMTP server' at the bottom of the screen. 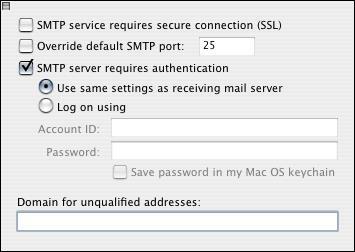 The settings for your outgoing mail server (SMTP) are shown here. Make sure that your settings look like the settings shown in this screenshot. 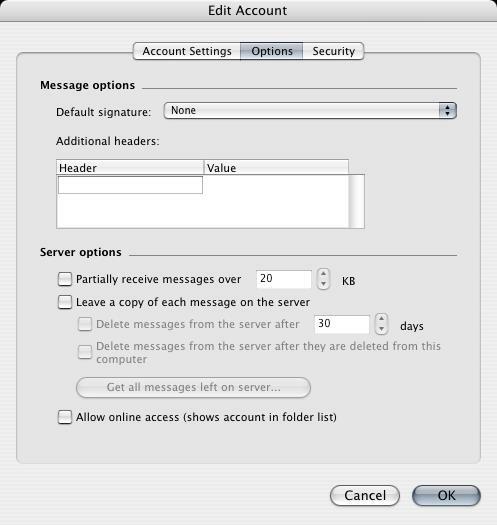 Put a checkmark in the box and make sure the option is on 'Use same settings as incoming mail server'. Click the top left square to close that window and return to the main 'Edit Account' screen. Click on the 'Options' tab. Click 'OK' to close the window and save any changes if it prompts you. Close the 'Accounts' window. 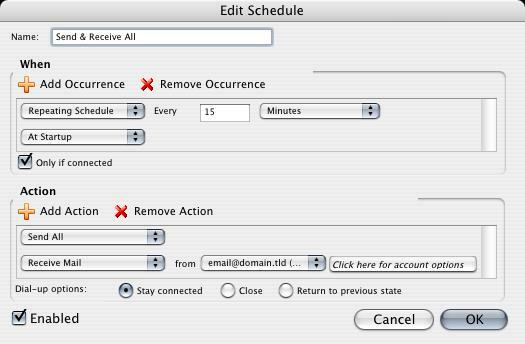 Click on the 'Tools' menu at the top and hover your mouse over 'Run Schedule' and then click 'Edit Schedules'. Click on the 'Send & Receive All' schedule and click the 'Edit' button at the top. Change it to '15' minutes. 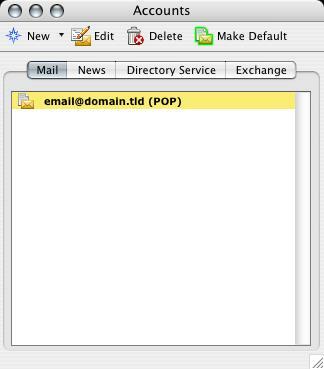 Click 'OK' to close that window and return to your 'Inbox' and now you should be able to send and receive email. 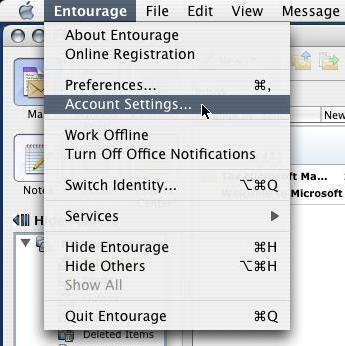 Click on the 'Entourage' menu > 'Account Settings...' > Highlight the account > 'Edit' button at the top > 'Account Settings' tab > 'Click here for advanced sending options' button below 'SMTP server' at the bottom of the screen. 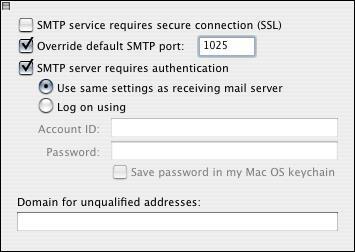 Put a checkmark in 'Override default SMTP port' and change it from 25 to 1025.